This week we Ask The Expert for a special blog on firework displays! 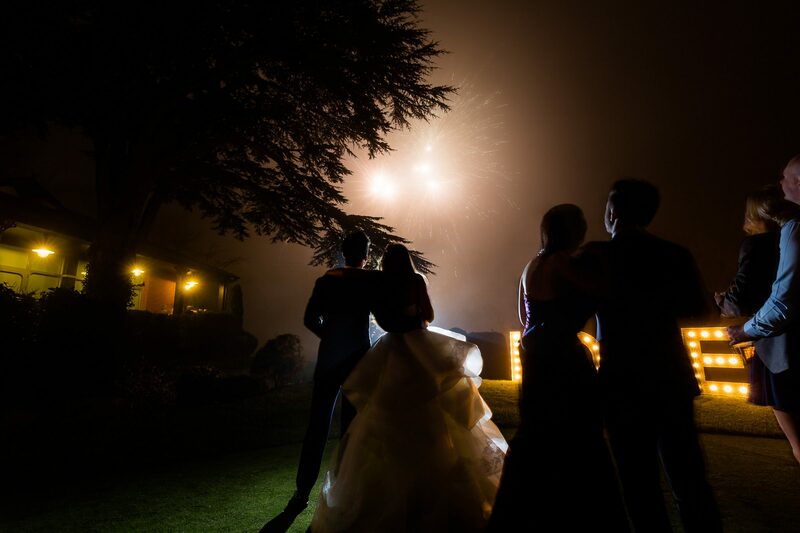 We have seen a huge increase in couples wanting bespoke, awe-inspiring firework displays as a grand finale to their special day. So we asked the guys at Fireworks Crazy their expert advice on fireworks at weddings. 1. I want a fireworks display, where do I start? It really depends on where the display is, your budget and how long you want a display to last. The first thing you need to do is make sure your venue a) allows fireworks and b) allows you to hold your own display or hire a display company to hold one for you. Then you need to think about your budget. From £395 we can provide you with fireworks and a remote ignition kit to take care of it all yourself – this is known as our self-fire package and will give you a display around five minutes long. If you want to spend more then we can go up to £1,995 and beyond for 12 minute displays set to music, for example. Other considerations you may need to make are whether you need to use low noise fireworks. For example, if you’re having your wedding reception at a cricket club in the middle of a residential area, the neighbours might not appreciate some of the biggest rockets in the world being set off over their houses late at night. For summer weddings you should think about the timing, too. If you have children at your wedding then fireworks are probably something they’d enjoy. How many of them will experience it if you have your display at 10pm in the evening? 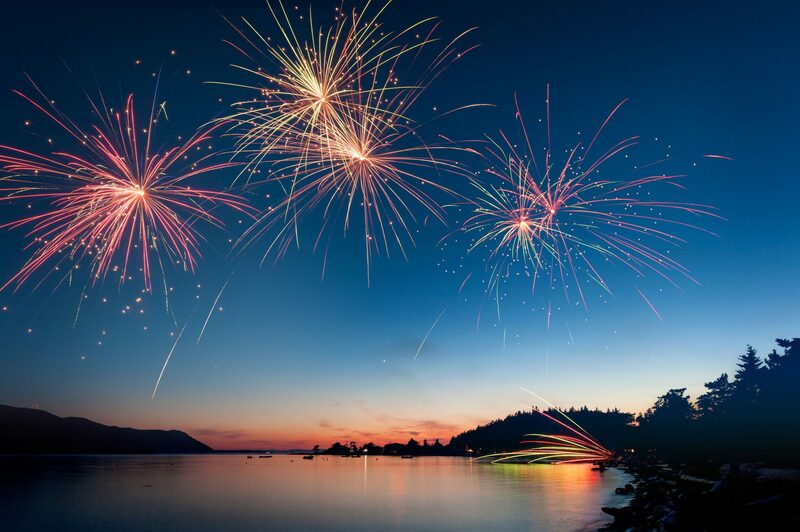 Fireworks can look just as stunning at dusk; it doesn’t necessarily need to be pitch black! 2. Can you customise shapes, colours and music? Yes certainly! We can customise the display to the wedding colours upon request. We can also create pyromusical displays, however, the shapes are limited to the fireworks that we stock. 3. How long is the perfect fireworks display? There isn’t really an answer to this one, but what we would say is that longer doesn’t necessarily mean better. Our most popular display option is the Platinum Package which gives a 9 minute display. A 12-15 minute display is okay if you know what you’re doing, but beyond that you might struggle – you don’t want the audience getting bored and if it’s cold they probably won’t be impressed. Another consideration is that you want to save the best to last. If you start firing big rockets after two minutes and you’re nowhere near the end of the show, you have to sustain the excitement. Unless you have a multi-million pound budget like you’re planning London’s New Year fireworks, it can be hard to get this right. End with a bang! 4. How much do fireworks displays cost? From £395 up to £1,995 and above, to whatever you want your budget to stretch to really. If you want a longer display and want to spend £10,000 to make it happen, then of course we’d be happy to help, but realistically most people are looking for the price ranges mentioned just now. 5. When do you need to book your fireworks display? The earlier the better. If your display is for a wedding or another event, we can remove all of the hassle by dealing with your venue direct to plan the display. Just make your booking, put us in touch with your venue and we’ll see you on the day. 6. Can I push the button?! Yes! Our self-fire package comes with a remote ignition kit to do it yourself anyway, while if you book one of our larger packages that utilises our digital firing system, we’re more than happy to show you how it’s done and let you set off your display. Some venues don’t allow fireworks due to being close to livestock or residential areas, but don’t let that ruin your sparkle! Sparklers are a great alternative and yield some amazing photographs for your wedding album. Thank you to Fireworks Crazy for the advice for this article. Fireworks Crazy is a professional service offering polished and bespoke firework displays. They also operate nationwide so click the link above to find out more.